Hawaii DeLorme Atlas: Road Maps, Topography and More! 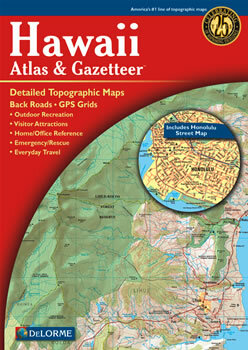 Explore the islands of Hawaii with the DeLorme Atlas and Gazetteer! This atlas has 51 large pages of detailed shaded relief maps with a handy index of place names and map features. The back cover of this atlas has a large map of the Hawaiian Islands with an overlying grid. Each cell of the grid contains the page number for a detailed map of that area. The detailed maps in the atlas show physical features, which include: mountains, volcanoes, valleys, canyons, forests, lava flows (on the Big Island), streams, rivers, springs, harbors and bays. Man-made features, such as towns, villages, cities, reserves, roads, trails, highways, airports, parks and boat ramps are also shown. There are 13 pages of reference information giving detail to Hawaii's activities and points of interest. These include: beaches, trails, recreation areas, scenic drives, historic sites, attractions, golf courses, gardens, boating facilities and unique natural features. In addition, are introduction pages that include information on each island, the Hawaiian language, a geological timeline and Hawaii's volcanoes! There are so many extras you will be impressed with the usefulness of the DeLorme Atlas and Gazetteer!